Heat oven to 350°F. Bake rolls as directed on bag. Meanwhile, microwave broccoli & cheese sauce as directed on box. Pour into ungreased 1 1/2-quart microwavable casserole or baking dish. Microwave rice as directed on pouch. 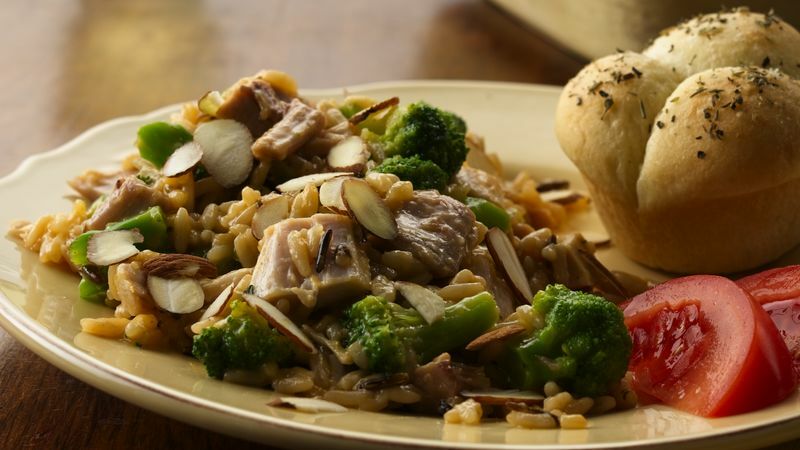 Stir rice and turkey into broccoli mixture. Cover; microwave on High 3 to 5 minutes or until hot. Just before serving, sprinkle almonds over casserole. Brush rolls with butter; sprinkle with Italian seasoning. Serve warm with casserole. No turkey leftovers? Pick up a rotisserie turkey breast at the supermarket.